Menopause is a natural process that begins as the body begins its natural transition towards complete cessation of the menstrual cycle. This process is characterized by hormonal changes and the associated side-effects of these changes, most famously hot flashes. Tinctura Tech’s Transition is a concentrated herbal compound specially designed to mute and even prevent the problematic symptoms of menopause, and not only hot flashes, but also irritability, insomnia, and more. Transition’s formula contains naturally occurring phytoestrogens, and importantly, has no side effects. Ingredients: Dioscorea villosa (wild yam), Vitex agnus-castus (Abraham’s bush), Actaea racemose (black cohosh), Trifolium pratense (red clover), Salvia officinalis (common sage). Wild yam – An anti-inflammatory, antispasmodic, and anti-cramping agent, it induces hormonal activity mimicking estrogen activity. With its phytoestrogenic activity, wild yam is effective for treating irregular menstruation and menopause. Abraham's bush – Abraham's bush has been known for many years as a plant that regulates menstrual activity and increases milk production. 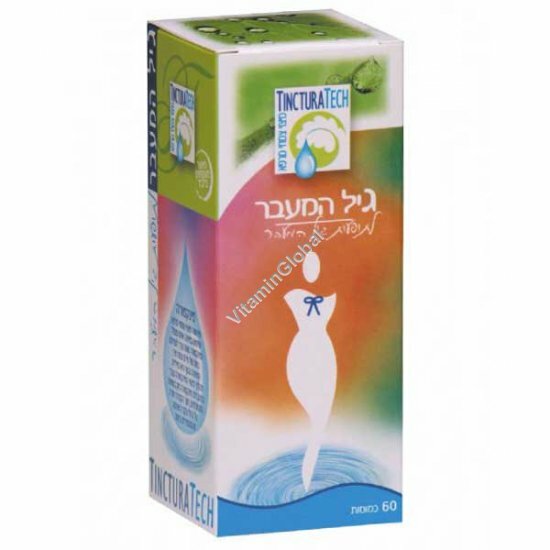 Its activity is known for encouraging hormonal balance, and mitigating against skin diseases of a hormonal background. Black cohosh – A root known in folk medicine for preventing menopausal symptoms such as hot flashes, mood swings, and vaginal dryness. The plant does not stimulate estrogen production, yet at the same time compensates for estrogen deficiency. Red clover – Contains isoflavones known to help treat menopause and relieve the pain of premenstrual syndrome. A phytoestrogenic plant that significantly reduces the occurrence of hot flashes, red cover also reduces the risk of having a heart attack. Sage – A phytoestrogenic plant that affects the hormonal system, it is also an antiseptic, antispasmodic, regulates menstruation, and reduces sweating. It is designed to treat the hot flashes and excessive sweating caused by menopause. Directions: 1-3 capsules per day, as needed, with a glass of water. Kosher Parve under the supervision of the Badatz Mehadrin of Rabbi Avraham Rubin. Not for use in pregnant women or nursing mothers, even to treat the same symptoms listed above caused by non-menopausal factors. If you are taking prescription drugs, consult your doctor before using any supplement.